Along with crack violinist Lois Fry, we wrote & performed a soundtrack for a production of Alice in Wonderland in '98, then (again with Lois) provided music for the troupe's production of Under Milkwood in '99. After taking a couple of years off, we composed & performed a soundtrack for Antigone in 2001. 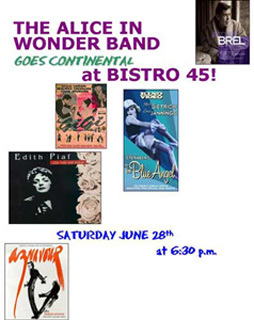 This was a bit of an extravaganza— in addition to making use of some talented singers in the drama troupe, our trio expanded to a quintet with the addition of Art Troutner on oboe & Barb Dixon on djembe. This group, along with singers Kati Sheldon & Deadre Chase, then became The Alice in Wonder Band. The group later grew again with the addition of clarinetist Bob George & drummer/percussionist Deb Cahill. The Alice in Wonder Band was, in the words of one fan, “eclectic as all get out.” We performed a number of Eberle’s original compositions, but we also played material ranging from Erik Satie on uke, electric bass & clarinet to “Baby Elephant Walk” with a slide whistle as one of the lead instruments. Eberle sometimes used poems for lyrics, & did settings for Emily Dickinson, Elizabeth Bishop, H.D., & Joanne Kyger, as well as for one of my poems (you can hear that here). Our shows were infrequent, but they were extravaganzas, complete with dance routines & elaborate sets contructed by our good friend Lorie Davison-Hohs. Not everything worked, but a lot did, & we (almost) always had fun trying. 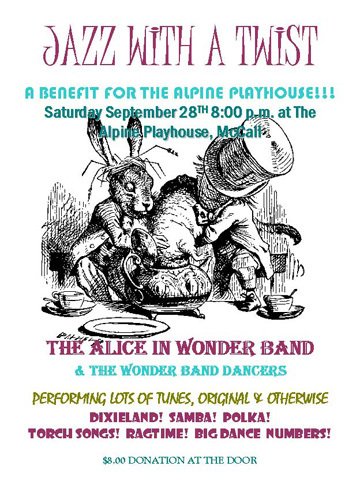 The Alice in Wonder Band played together from 2002-2004.
monthly extravaganza, “The Smallest Show in Town”—how many small town Idaho bands get to share the stage with the world recorder holder for solving the Rubix cube? & FINALLY: Check out the gallery of Alice in Wonder Band pix here.